Our United States Federal Judges and Justices in the U.S. Federal Courts, and Ohio Judges and Justices in the State of Ohio Courts, along with numerous federal and State of Ohio Representatives, Agencies, and other government employees under Oath of Office and duty have illegally "given aid and comfort" to "terminate" the meaningful Constitution and laws of the United States in a horrific and terrifying legal matter(s) within our American courts of law for the past 18 years! The Courts under the United States and State of Ohio have "terminated" the Fifth, Seventh, and Fourteenth Amendments of the Constitution of the United States against all American citizens. The Judges and Justices of the American courts have terminated 225+ years of your legal protection, and valuable legal right in action, to a "Jury Demand" action in a court of law, for executing a "Trial by Jury in Civil Cases" action in our American courts of law. Our Public Service herein is a powerful and longstanding project to support and affirm The Constitution and laws of the United States, along with protecting and upholding the colorful and meaningful Flag of the United States in a court of law, and furthermore around the world. Please help us as litigants and American Citizens, representing you in a court of law ("We the People of the United States", litigants with courage to proceed in a court of law for 18 years while others under oath from the American Bar Association will not intervene and support the rule of law) to protect your basic civil rights under the Constitution of the United States; to "due process of law" to a "trial by jury" action in a court of law upon a "Jury Demand", to determine all genuine issues of disputed material facts of alleged insurance company breach of contract and fraud for a jury to decide, not determined and ruled upon by a possibly corrupted bench judge and his peers. This is a "bad faith" case matter of home foreclosure, "insurance company fraud" and "fraud on the court" are serious violations and crimes against the fundamental, substantive and substantial constitutional rights in action to "due process of law" for a "Trial by Jury in Civil Cases", under the meaningful U.S. Flag standing tall in every American courtroom of law. See: Current Supreme Court of the United States Case # 17-8816 ~ Writ of Certiorari ~ "to be more informed" on our 9 years of home foreclosure proceedings, directly related to 22 years of "insurance company fraud", along with 18 years of "fraud on the court" upon the illegal "termination" of a legal party's "Jury Demand" action for a "trial by jury" action in a court of law. 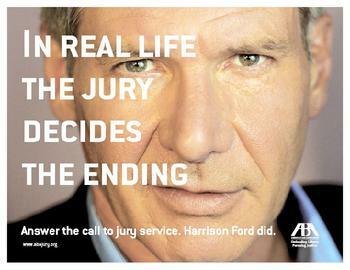 In Real Life the Jury Decides The Ending! How long would you pursue your valuable civil rights and justice in a court of law? Insurance company fraud, bad faith with malice, and fraud on the court have illegally attempted to "terminate" your meaningful U.S. Flag in a courtroom of law which represents The Constitution of the United States and statutes in a court of law. The United States Flag represents "due process of law" to a "Jury Demand" action for a substantial "Trial by Jury in Civil Cases" action in our State(s) and Federal courtrooms. We are now pursuing 22+ years of ongoing insurance company bad faith and fraud matters, with18+ years of "fraud on the court" case matters against the Americans citizens and their United States Flag, and the loss of 225+ years of American Constitutional history. Why? Acts of breach of duty, breach of contract, acts of insurance company policy theft, and furthermore acts of performing perpetrated fraud on the courts, while knowingly and willfully attempting to "terminate" the American citizens "trial by jury" process of law. This is a most serious violation and crimes against you the reader, and against your U.S. Flag represented in your American courtrooms of law. The insurance company Fortis Benefits Insurance Company (aka Assurant Inc.) had denied Long Term Disability (LTD) insurance policy benefits to the insured party for nearly two years (only monetary benefits)(1996), and still to this date have failed to deliver all due remaining benefits (Now 22+ years past). The only option the insured party could do to recover due benefits was to sue the insurance company in a court of law for breach of contract and bad faith with malice against the insured party. And they did sue, with an expressed "jury demand" for a "trial by jury in civil cases" on these matters of "insurance company fraud". In addition, the legal standard of law in the United States of America also dictates a "trial by jury" action enforced by way of the Constitution of the United States; Bill of Rights; First Amendment (Petition), Fifth Amendment (Rights), Seventh Amendment (Jury in Civil Cases), Ninth Amendment (Other Rights), Tenth Amendment (State Powers), and Fourteenth Amendment (Rights of Citizens). Both of these laws (independent or together) are a valuable legal "right of action" and measure of legal protection to all American Citizen in a court of law. Any deviation of these laws is a “perversion of justice”, and possibly a criminal act for a Grand Jury to decide for a "True Bill". However to this date, we have not had our day in court with a jury of our peers. Why does it take over 18+ years to get a "trial by jury" action in our American courts of law, and further find remedies of relief to matters of "insurance company fraud"? Where are the insured party's own "government representatives" (45419-4035) and (while under Oath of Office) who have failed to "support and defend" the Constitution of the United States of America for their constituents, and the rest of the United States citizens as “We the People of the United States”... and failed our great Veterans who have brought freedom,liberty, equality and justice under the great Flag of the United States. This is clearly a violation of law and a critically defiant matter of public safety and great general interest around the world. What should be done to "rescue" the Constitution of the United States. How long would you fight for your valuable LTD insurance policy benefits, and due process of law in our State and Federal courts of law, in order to acquire your valuable and timely due insurance benefits at a critical time of need? See: http://badfaith.info ~ A true story of insurance company fraud, insurance company theft, and perpetrated fraud on the court, that is against you and all American citizens. Our Mission is to support and defend the integrity of United States of America Flag and expressed legal rights within our American judicial courtrooms of law. To preserve a "trial by jury" action with "due process of law" in your American courts of law, as dictated by the straightforward text of The Constitution of the United States, and as the legal standard of law in our American courts. Thank you for your donations to support and affirm your Constitution of the United States for Freedom, Liberty, Equality and Justice for all. Help rescue the meaningful US Flag in our American Courtrooms Law!